"Freedom," said Bob Goodlatte, the House Judiciary Committee chairman, quoting President Ronald Reagan as he began a hearing Thursday morning, "is never more than one generation away from extinction." Goodlatte was suggesting that freedom was under dire threat because Lynnette Hardaway and Rochelle Richardson, two pro-Trump social media personalities most commonly known as "Diamond & Silk," claimed they had been censored by Facebook. They had not been censored. Hardaway and Richardson's claims had been thoroughly debunked. But Goodlatte and his committee nevertheless went on to spend several hours on the issue. At times, watching the surreal spectacle unfold, it felt as if the doors to room 2141 of the Rayburn House Office building had transported those who walked through them to a place where facts came second to political narrative and outlets known for misinformation could be held up as gospel truth. The affair was a fitting end to weeks of right-wing media fueling a false narrative that Facebook is censoring conservatives. Earlier this month, Facebook erroneously told Hardaway and Richardson that their content had been deemed "unsafe for the community." Facebook quickly said the message had been sent in error, and immediately sought to contact both Hardaway and Richardson. But since the incident, the two sisters from North Carolina have used it to accuse the company of censorship, becoming lightning rods on the right for their campaign against the big tech company. If Facebook, which declined an invitation to attend the hearing, was counting on Congress to be responsible and hold Hardaway and Richardson to the truth, the company was mistaken. 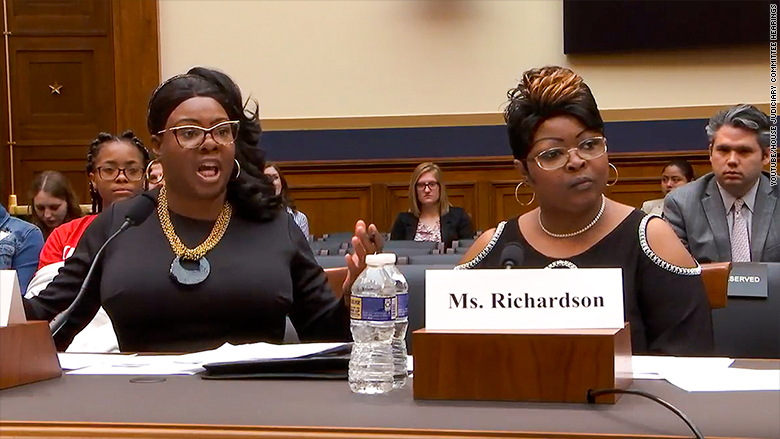 The Republicans on the House Judiciary Committee seemed to very much enjoy having brought the social media celebrities to Capitol Hill, and seemed OK with their hearing room being effectively used as a YouTube set for an extended episode of the Diamond & Silk show. Over the course of nearly three hours, Republicans on the committee allowed the social media stars to pummel Facebook, and to do so unchallenged, even when some of their claims were so absurd that Democrats on the committee could be seen laughing in response. Hardaway and Richardson were given license by Republicans to repeatedly claim that Facebook had "censored" their page, even though the social media company did not do so. When asked if their page was "blocked," Richardson answered in the affirmative, despite Facebook having never blocked or restricted access to the "Diamond & Silk" page. At one point, after Hardaway and Richardson denied receiving a payment from the Trump campaign, in contradiction to Federal Election Commission records showing that they had, Democratic Rep. Hakeem Jeffries reminded the sisters that they were testifying under oath and, thus, "subject to the penalty of perjury." The committee's Republicans themselves spread misinformation about Facebook's policies and practices. Goodlatte, for one, falsely suggested Hardaway and Richardson had been censored on Facebook. Others did as well. Rep. Steve King entered articles about supposed social media censorship written by Jim Hoft, the founder and publisher of The Gateway Pundit, into the congressional record. King said he hoped Hoft, who is currently named in at least two lawsuits that accuse him and his site of defamation, might one day testify before Congress on the topic because he has found his personal conversations with him to be productive. The hearing left Democrats angry and upset. Rep. Pramila Jayapal said she was "embarrassed" by the whole thing. Rep. Ted Lieu went even further, saying, "This is a stupid and ridiculous hearing." Asked for comment on the testimony from Hardaway and Richardson, a representative for Facebook only pointed CNN to CEO Mark Zuckerberg's previous testimony before Congress, in which he said he is "very committed to making sure that Facebook is a platform for all ideas." Before the hearing, Hardaway and Richardson had gone on "Fox & Friends," an outlet that had been integral in pushing the false narrative about supposed social mediacensorship, and said Facebook's avoiding them at the hearing "proves they're guilty." After the hearing, Hardaway and Richardson posed for photographs with Republican members of the committee. When reporters, including this one, approached them for comment, the duo left the room.